The traumatic dissections of extracranial carotid arteries occur most frequently in the internal carotid artery. Common carotid artery (CCA) dissection is a rare cause of cerebral ischemia with only a few cases having been reported. This case had a unique cause of trauma - paw of a tiger. This paper reports a case of a 15-year-old girl who was attacked and dragged by a tiger during night hours, holding her neck with paw for around 50 m. Patient was released from the tiger's grip when villagers gathered and the animal fled away. There was blunt injury of neck, which was thereafter sutured. On the 3 rd day, she developed left hemiplegia. There was no history of unconsciousness or seizure. The examination showed sutured wound at neck with blunt injuries on back, thigh and forearm. Bilateral carotid pulsations were normal. Neurological examination revealed left facial weakness of upper motor neuron type and hypotonia of the left side with medical research council grade 0/5 power in left upper and lower limbs. Magnetic resonance imaging brain showed infarct in right fronto-parietal region [Figure 1]a. Right common carotid artery (RCCA) had dissection with pseudo aneurysm on magnetic resonance (MR) angiography [Figure 1]b and c. The caliber and flow signal intensity distal to dissection was normal. The left CCA, bilateral internal carotid arteries, external carotid arteries and vertebral arteries were normal. She was treated with low molecular weight heparin and physiotherapy during hospital stay and was discharged after 12 days on oral anticoagulant. Patient's parent did not give consent for cerebral angiography and endovascular intervention. At time of discharge power of left upper limb was 1/5 and left lower limb was 3/5. Follow-up neurological examination after 6 months revealed improvement in motor power (left upper limb 3/5 and left lower limb 4/5), but no change in the size of RCCA pseudoaneurysm on MR angiography [Figure 1]d.
The dissection of cerebral circulation commonly involves extracranial internal carotid artery or vertebral artery. CCA dissection and pseudoaneurysm is a rare disease. Dissection of CCA is either traumatic or spontaneous. , Our case had a unique cause of trauma, paw of a tiger resulting in dissection of CCA. Dissection of CCA can manifest as cervical pain, acute monocular blindness or hemiplegia. , Some of the patients show rapid recovery of the neurological deficit. Our patient showed gradual recovery as she had dense hemiplegia due to a large infarct in middle cerebral artery territory. The mechanism of an infarction in right middle cerebral artery territory in this case could be thromboembolism from RCCA dissection and peudoaneurysm. The non-invasive tools to diagnose dissection of CCA are ultrasonography, computed tomography angiography and MR angiography. In our case, CCA dissection and pseudoaneurysm was well-documented by MR angiography. Angioplasty and stenting of CCA is feasible,  but patient's parents did not give consent for it. 1. Okada Y, Shima T, Nishida M, Yamane K, Kagawa R. Traumatic dissection of the common carotid artery after blunt injury to the neck. Surg Neurol 1999;51:513-9. 2. 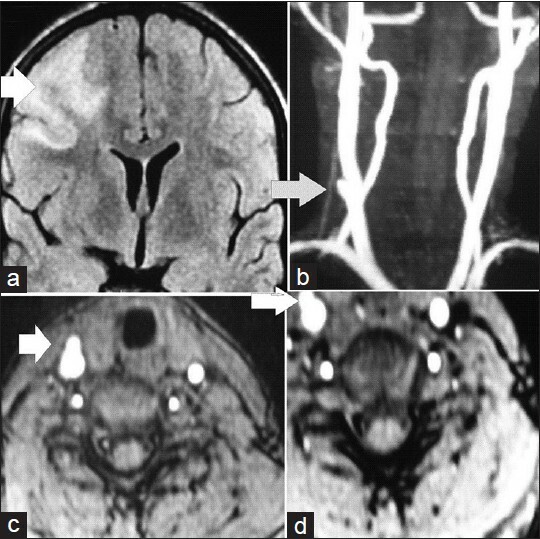 Chen YC, Lee TH, Chen CJ, Chen ST. Spontaneous common carotid artery dissection: A case report and review of the literature. Eur Neurol 2003;50:58-60. 3. Hirth K, Sander S, Hörmann K. Common carotid artery dissection: A rare cause for cervical pain. J Laryngol Otol 2002;116:309-11. 4. Lubin J, Capparella J, Vecchione M. Acute monocular blindness associated with spontaneous common carotid artery dissection. Ann Emerg Med 2001;38:332-5. 5. Kadkhodayan Y, Jeck DT, Moran CJ, Derdeyn CP, Cross DT 3 rd . Angioplasty and stenting in carotid dissection with or without associated pseudoaneurysm. AJNR Am J Neuroradiol 2005;26:2328-35.